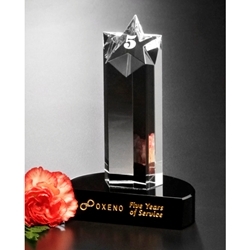 Prominence Star Crystal Awards are the perfect recognition award for the star performer on your team. Each star award is made of optical crystal with a black glass base. 3.5" wide x 5.5" tall x 2" deep, 2lbs. Additional engraving areas and other personalization options available at additional cost.